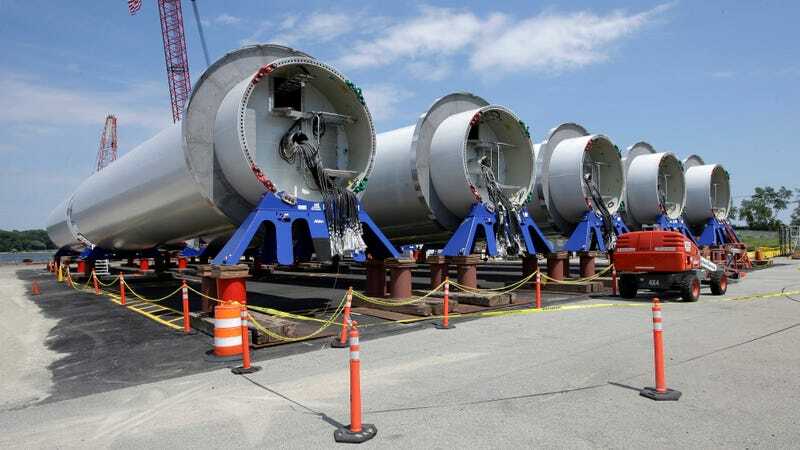 Sections of wind turbine towers before they were assembled to form the Block Island wind farm. There’s a huge amount of energy blowing in the wind right offshore, but America has been slow to take advantage of it, with just one small offshore wind farm in U.S. waters. But that may soon be changing. Last month, Massachusetts selected an 800 megawatt (MW) offshore wind project to power about 400,000 homes off Martha’s Vineyard, while Rhode Island announced a 400 MW project in the same general area. Around the same time, New Jersey Governor Phil Murphy committed to a whopping 3,500 MW of offshore wind by 2030—the largest state pledge to date. Massachusetts as well as other states like New York have rolled out ambitious offshore wind targets in recent years too, and even the federal government has made some tentative nods of approval. On Tuesday, the House Natural Resources Subcommittee on Energy and Mineral Resources had a surprisingly harmonious discussion of a bill aimed at boosting offshore wind through job training programs. In April, oil-loving Interior Secretary Ryan Zinke said there was an “enormous opportunity” blowing in the wind offshore. “I think a lot of the success [of offshore wind], if it does continue to steamroll, will depend on how well these projects are executed and what kind of prices they come in at,” Doug Vine, Senior Energy Fellow with the Center for Climate and Energy Solutions, told Earther. Indeed, the cost of generating juice is still something of a challenge for offshore wind in the U.S. Power from the five turbines comprising the Block Island Wind Farm—America’s first and only offshore wind farm—is priced at about 25 cents per kilowatt hour (kWh). That’s cheaper than the expensive (and dirty) diesel fuel residents of the sleepy vacation town of Block Island were using before, but still considerably higher than what ratepayers throughout the state are used to. Things are moving in the right direction, though. In Europe, the cost of offshore wind has dropped steeply in recent years as the market has grown and turbines have become bigger and better. Some of that cost reduction is being seen stateside, too. Maryland commissioned two offshore wind farms last year at a 20-year fixed price of 13 cents per kWh, about half of Block Island. Still, even 13 cents per kWh is pricier than your typical onshore wind or natural gas facility. That’s why Vine thinks the most successful early projects are going to be those sited near energy-gobbling metropolises with unmet demand. If the offshore wind optimists are right, cost will continue becoming less of a barrier. There’s also a great deal more regulatory certainty than there used to be, thanks to the Bureau of Ocean Energy Management developing a framework that engages the public every step of the way from planning to construction. That public engagement is key, according to John Rogers, a senior energy analyst at the Union of Concerned Scientists. To him and many others, the biggest obstacle in 2018 isn’t price or technological readiness but people. The streak of NIMBY-ism that famously doomed the Cape Wind project years ago is still alive and well in many oceanfront communities. 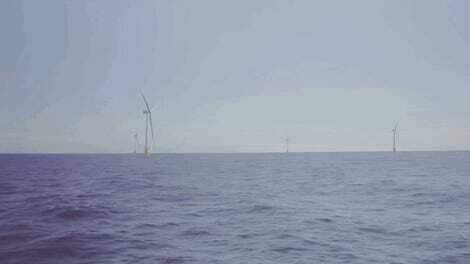 Offshore wind has also been met with resistance from folks in the commercial fishing industry, who worry about the turbines interfering with their operations. But while Cape Wind was “fully composed when it sprang on the public scene,” as Rogers put it, there’s been a great deal more public consultation with recently-approved projects. “It’s not going to satisfy everybody but it was a real dialog,” he said, speaking of the process to select areas for the recent New England leases. Morrissey said that “bringing people along through the permitting process” is what’s going to define success for offshore wind. To him, a big part of that is making sure the projects create local jobs. Today, those jobs are mainly going to be in assembling and operating turbines, but in the future proponents hope to see things like blade manufacturing happening on American shores, too. Whether Congress will back up those words with actions that support the nascent industry is still TBD. So is the bigger question of whether offshore wind will one day power cities up and down the Eastern seaboard. But if ever the industry had an opportunity to reach for that goal, it would seem to be now.